Captain James Cook was the first European to visit the peninsula in 1769. 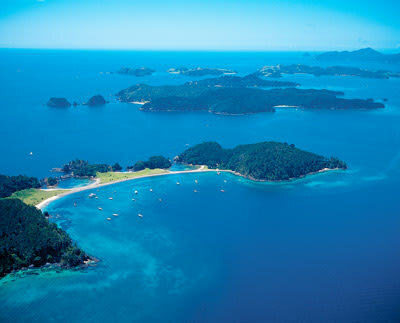 He named it “Bay of Islands” after the 144 islands that lie sheltered in the 260km bay on the peninsula’s eastern coast. European whalers and sealers settled on the lands soon after and began felling the ancient Kauri rainforests considered to be some of the oldest rainforests in the world. Poking out of New Zealand’s North Island like a sore thumb, the 330 kilometre, sub-tropical Northland peninsula, and neighboring Bay of Islands, is home to some of New Zealand’s best fishing and sailing in the country. The summer playground for Auckland locals - Northland and Bay of Islands (Maori: Te Tai-tokerau) are an ideal destination for travellers looking that perfect blend of sun, surf and sand. First settled 700 years ago by the Maori Ng­apuhi tribe, the Northland and Bay of Islands regions took the name Te Tai-tokerau meaning “The Northern Tide”. The peninsula is also referred to Te Hiku o Te Ika - “The tail of the fish” in reference to ancient Maori lore when the whole North Island was once a huge fish. Approximately one third of the population in Northland are of Maori decent and the region is considered by many to be the birthplace of Maori culture in New Zealand. Indeed, the Northland (and Bay of Islands) region was the location of the first Maori capital at Okiato. It is also where the Treaty of Waitangi was signed between the Maori and British Crown. The Kauri forests of Northland hold some of New Zealand’s most precious flora including the revered Tane Mahuta – “Lord of the Forest”, and Te Matua Ngahere – “Father of the Forest” – kauri trees. These methuselahs from an ancient rainforest long since passed are New Zealand’s oldest trees at over 2,000 years old. Today they stand tall in Northland’s Waipoua Forest. Tourists are advised to wear clean footwear to prevent the spread of the kauri dieback disease contaminating the site. Auckland is the departure point for all Bay of Islands trips. 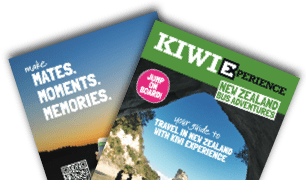 Take a Kiwi Experience bus north to the town of Whangarei. Water babies should journey out to the nearby uninhabited Poor Knights Islands, which are considered one of the top 10 best scuba dive sites in the world. The volcanic islands provide spectacular drop offs, walls, caves, arches and tunnels. Or further north in the Bay of Islands the scuttled shipwrecks of the HMNZS Canterbury and the former Greenpeace flagship, Rainbow Warrior. Both wrecks can be experienced with the expert dive team at Paihia Dive (from $229nzd). For those who prefer to keep their heads above the water, speak to your Driver Guide about the sensational Hole in the Rock Dolphin Cruise off the coast of Paihia ($92nzd). 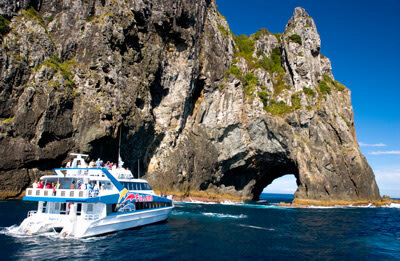 The half-day cruise takes you out to the famous Hole in the Rock on Motukokako Island on a first class catamaran. Keep an eye out for bottle-nose dolphins playing in the turquoise waters. The Dolphin Eco Encounter ($104nzd) allows you the extra thrill to swim with dolphins if the conditions allow. If fishing is more your sport of choice (as it is with many visitors to the Bay of Islands), get in touch with the experienced anglers at Spot X Fishing. They provide all the bait and tackle, you just provide the muscle power (from $90nzd)! Being a water wonderland there are other great experiences to be had in ‘The Bay’. Spend a day cruising the islands on the chartered yacht, She’s a Lady Sailing ($97nzd), or explore the pristine coastal waters via paddle power with Coastal Kayakers. A full-day guided kayak tour takes you from the Waitangi Estuary to the uninhabited Motumaire Island, where you can snorkel and swim before heading back (from $85nzd). If you are craving more adrenaline activities, speak to the guys at Skydive Bay of Islands about jumping from a plane at 12,000 ft. Experience 40 seconds of free fall before the chute opens to a spectacular view above the stunning Bay of Islands coastline. Jumps begin from $269nzd . Likewise, hook a parachute to the back of speedboat and soar to 1,200ft with New Zealand’s highest parasailing troupe, Flying Kiwi Parasail. The view is breathtaking and you can share it with a friend on a tandem parasail ride (from $95nzd). Too much action? Then a leisurely 2-hour ride with Horse Trek’n could be just what you need. Suited to all experience levels, the tours wind their way through the Waitangi forest before opening up to amazing views of the surrounding area. Trips from $95nzd. Speak to your Driver Guide about booking activities in the Bay of Islands and Northland. 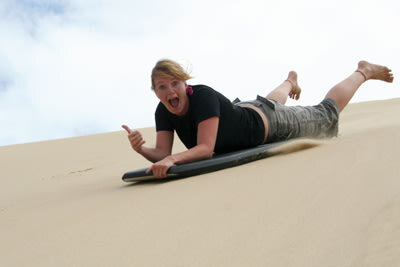 Kiwi Experience guarantees that, your first nights accommodation is guaranteed in Bay of Islands. Kiwi Experience recommends pulling up stumps at the beachside Base Bay of Islands hostel. Located just 50 metres from the water, the hostel features modern kitchen and laundry facilities as well as a spa and swimming pool and the vibrant Pipi Patch bar. Accommodation prices start from $29nzd a night in an 8-bed dorm to $50nzd per person for a Private Double Room with ensuite. The hostel also has a girl’s only dorm. If you are travelling during the warmer months, ensure you book your accommodation with your Driver Guide for a guaranteed spot as vacancies can be limited.